Spring is such a great time to wear kimonos. I have a few of them now. The majority of them are blue of course, since it's my favourite colour! The two below are both navy and floral print but even worn with navy tanks and denim shorts they look quite different. I mentioned when I first got the second one that I already had a similar one, it was good to do a side by side post and see how different they are. The first time I wore this tank it was a little layered up as it was a cooler day, but when I bought it I had outfits like this in mind. The tank, shorts and kimono combo was one I wore a lot last spring/summer, only with maternity pieces. This is basically the non-maternity version of this outfit! 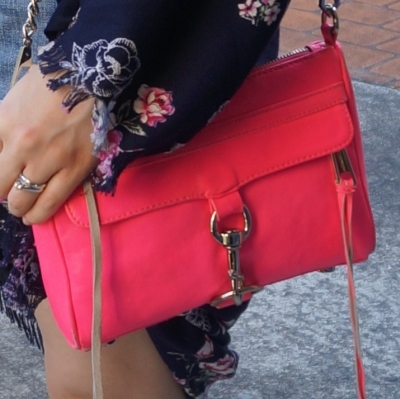 I like the combination of the neon pink bag with the print on the kimono, I've worn them together before. Wore this out to run a couple of errands and take Baby Boy for his weekly weigh. This is the second time I've worn this tank and I'm reviewing everything I buy after I wear it twice in the month I buy it. I've written more about why I do this here, but it's basically to make me think more critically about my purchases and make sure I'm adding sensible choices to my wardrobe. I really like this tank! A great basic, for $3 you can't go wrong, and I didn't have a plain navy tank like this in my wardrobe. I am a little annoyed I've seen some other colours of this on sale in Kmart recently for even less...ha! But overall I'm pleased with this purchase, I know it will gt a lot more wear and I don't have any concerns with the quality even with the low price. Last worn: Ray-Ban Wayfarer, navy cocoon kimono, navy tank, denim shorts, Havaianas, neon pink mini MAC. Other ways to wear: kimono and jeans in autumn, navy tank and cosy layers, denim shorts and ankle boots, neon pink mini MAC and flares. Wore this out for a big day of Christmas shopping that I mentioned previously. While I was out to buy some specific gifts, I also had a few stores I wanted to check out myself and take advantage of having someone watch the boys while I was trying clothes on. This was a simple and easy outfit for a day of shopping, and it was easy to try things on too. Managed to get a new pair of shorts, one of the items off my wardrobe wishlist. I've mentioned before that a kimono is great for using as a breastfeeding cover. I ended up having to use this kimono to throw over the stroller for baby boy at nap time as well as I'd forgotten to pack a blanket. Kimonos really ares such versatile pieces! Last worn: floral kimono, navy breastfeeding tank, printed denim shorts, gold Havaianas, red saddle bag. Other ways to wear: floral kimono and stripes, navy breastfeeding tank and purple jeans, printed denim shorts and a blush blazer, red saddle bag and printed dress. Linking up with What I Wore, Fresh Fashion, Fashion Files, Thursday Moda, Fun Fashion,Friday Faves. Passion for Fashion, Mix It Monday. Congratulations on your 1000th post, that's amazing!! These kimonos are really pretty, you look great in both outfits! Have a wonderful day! Very nice kimono, I like the colour and the print. Lovely red bag with studs, looks really good on you. They are perfect for summer! And you can never have too many I think, haha! Kimonos would have been perfect for breastfeeding back in the day for me! I love how effortlessly chic you look with them. Navy blue looks superb on you dear Mica - and congrats on the thousandth post !!! I just love that kimono! I'm missing our warmer weather! Congratulations on your 1,000th post! Yay! A kimono is such a fun way to add a little bit of flair to a look and cover up when it's warm and both of these are so pretty! Mica, congratulations on your 1000th post! That is awesome! I've enjoyed each and every one. I had to look at mine. LOL I have 1005. You have an amazing kimono collection! Watching you style yours has given me inspiration to get one. They're so versatile and look great with outfits. I love the necklace! Gorgeous outfit too! You look so lovely! Adore the kimono! I'll never get used to you talking about xmas shopping while wearing summer clothes! Haha. Wow 1000 posts! That's insane and such a magnificent accomplishment. What a way to celebrate than with a super cool kimono too. And Kmart! Hehehe. Sometimes you can really find some great staple pieces. 1000 posts, that is a lot. Congrats on still being inspired and here for us. And kimonos... I did not end up getting one last summer, but I really, really want to for next! That's a very cute look! I absolutely love the tank + short + kimono combo for spring too! Just so comfortable and easy. Love yours! Love love love both of those bags! Especially the first one! And congrats on a 1000 posts! your elephant necklace is so cute-I have never seen one like that before! how many times have I mentioned I am jealous of your weather? So cold here! Whoa, 1000 posts is a big milestone! Huge congrats :) It must be so cool to have such a vast collection of photos and memories. You look lovely here as usual--the elephant necklace is so cute, and I'm loving the subtle fringe on your bags! Congratulations on your 1000 post milestone! That's a lot of lovely outfits! :) Would love to see a throwback post!! I need to do a throwback post! Sadly it requires a level of organisation I don't have quite yet, haha! Wow congrats on the 1000 post! That's an accomplishment! I love your saddle bag! Comgrats on the 1000th post! And what a cute outfit that is. Love the floral kimono with the navy! Wow! Happy 1K ... that's amazing! And you always look so darn adorable! 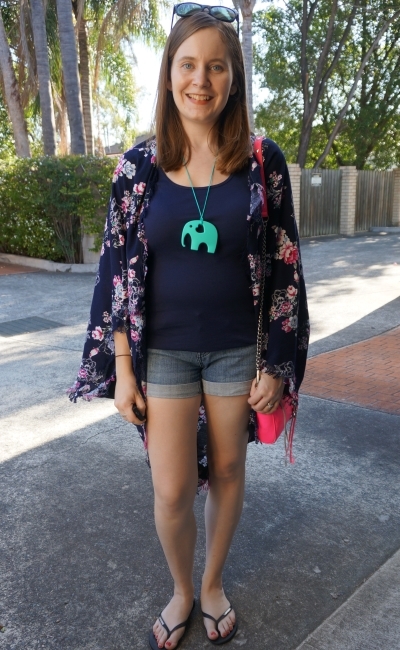 Love that kimono and cool elephant pendant! Yay! Congrats on your 1,000th post! Love your kimonos and that red saddle bag!! Oh my goodness! 1000th post? That's insane! That just made me go and check mine, I'm just shy of 1300 and I've been blogging over 6 years, but you have done way way more outfits than me! I love your necklace here though and the pink on your RM! That's stunning! Thank you all for your lovely comments and your congratulations on my 1000 posts milestone!